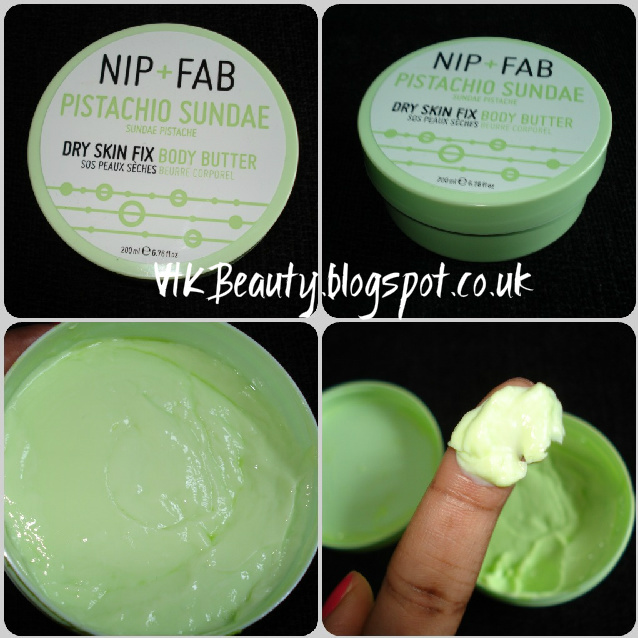 The Pistachio Sundae Body Butter is from the new Nip + Fab body butter range. It is a rich creamy moisturiser which helps "repair dry and dehydrated skin". It contains ingredients such as; shea butter, mineral oil and Aquaxyl which has a 24 hour moisture boosting effect. Aquaxyl is also said to improve the overall surface of the skin. The body butter retails at £9.95 for 200ml and is available to purchase in Boots or online. I did like the fact that the body butter was quite rich (although I would have loved it to be richer) and it also absorbed really quickly into the skin. My hand did feel nourished and moisturised afterwards and this feeling lasted for a few hours after I had applied it. The body butter clearly does its job. My real bug-a-boo with this product was the fact that I really could not stand the smell. Nip + Fab describe it as having a "deep, nutty scent of pistachio". It's a really strong scent, they weren't joking. Now don't get me wrong, I love munching on pistachios, but this scent was far too strong for my liking. They do have other scents such as Mango Smoothie and Coconut Latte. So all in all, I think it's a good moisturiser for the price. However, it does contain mineral oil which is good to note if you avoid using products that contain it. This body butter was contained in the #LiveBloggers goodie bag I picked up at the event last month. Have you tried any products from the Nip + Fab range? Great review! I can't imagine how the scent of pistachio is applied in a body butter. Never heard of such thing! But the body butter looks really nice! Maybe the Coconut Latte smells better!